When the settlement was announced, many people wondered aloud exactly how much HTC, an Android smartphone and tablet maker, would be paying Apple. There are now numbers, real or imagined, to fill in that blank. That said, whatever the license agreement forces HTC to pay Apple will come in addition to the fees the company is already paying Microsoft. What do the words “any adverse material impact on the financials of the company” mean? In the alternate reality where HTC does business — no iPhone copying here — no material impact could be as high as $8 per smartphone. Forbes, quoting Sterne Agee Analyst Shaw Wu, HTC will be paying Apple from $6 to $8 per smartphone as part of a 10-year licensing agreement between the two companies. This will generate up to $200 million annually in licensing fees for Apple. That, given the company’s nearly $200 billion in annual revenue and $131 billion in liquid assets, doesn’t amount to a lot. For HTC, which has experienced month-after-month of double digit sales declines, $200 million will absolutely be painful. 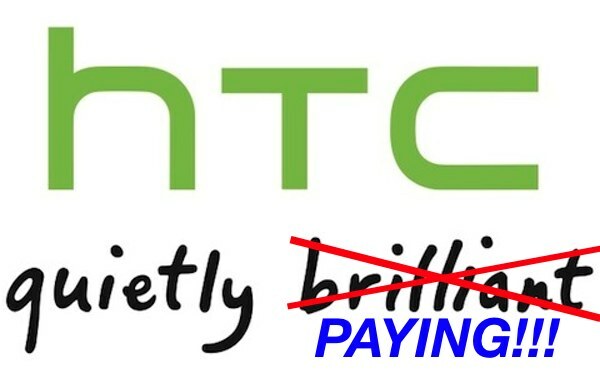 And, lest we forget, whatever the license agreement forces HTC to pay Apple comes in addition to the $5 per handset HTC already pays Microsoft.